Kevin Patton: When I look in my toolbox of teaching techniques, one of my favorite go-to tools is concept mapping. What is it, and how can we use it to enhance our A&P courses? Well stay tuned. Kevin Patton: In this episode I talk about blood doping at the Olympics, and today’s featured topic, concept maps. Kevin Patton: This episode is being released right in the middle of the 2018 Winter Olympics in South Korea, and I’m recording this segment just a few days ahead of that release. One of the hot topics directly related to Anatomy and Physiology teaching and learning is the big news right before the Olympics started, or at least one of the big headlines, and that was blood doping. Kevin Patton: We know that one large country, Russia, was banned at least as a national team from the Winter Olympics because of a doping scandal. Then subsequent to that, even subsequent to the opening of the games, we’ve seen more and more scandals coming out about blood doping. And you know what? That seems to be always the case with major sports championships and tournaments and the Olympics. Kevin Patton: Those of you that have followed my website and blog, The A&P Professor, may recall that for a number of years I had a whole page on blood doping up there because I think it’s a really excellent way to connect a number of different concepts in Anatomy and Physiology with the quote “real world” that students are more aware of. And things that are coming up on the news that they’re hearing about. Kevin Patton: Blood doping obviously, has some applications when we talk about erythropoietin and its role in regulating the production of red blood cells, which of course affect hematocrit level, which in turn affects the ability of the blood to carry oxygen. And we know that oxygen carrying capability can have a beneficial effect, at least in some elite athletes in terms of their performance. Kevin Patton: We’re finding out now, if you’re watching or listening to any of the events in the Olympics, that the difference between winning a medal and not winning a medal or winning a bronze versus a silver versus a gold medal is a matter of split seconds. And so any little advantage that you have, assuming that you’re already a contender, possibly is gonna make you a winner. Kevin Patton: So blood doping is something that’s highly attractive to athletes, especially at the elite level like this. But even at non-elite levels we see that sort of attractiveness to athletes. Kevin Patton: We can kind of talk about erythropoietin in particular, but there are other things that blood can be doped with, that is things that can be added to our body that wouldn’t naturally be occurring there on their own, at least not to those levels, that can enhance athletic performance. Kevin Patton: It’s a good opportunity then, to talk not only about the erythropoietin and its synthetic variations and precursors and so on. But also talk about these other ways to enhance athletic performance using synthetic or artificial means. And we can have that ethical discussion of what constitutes cheating or not cheating. Kevin Patton: We can also have that very important discussion of well what kinds of effects might this have on the body that yes, it might make you a better contender for a gold medal, but what is that going to do to other aspects of body structure and function. And is it worth the medical risks that are inherent in using various kinds of doping substances like erythropoietin and steroids and various things like that? Kevin Patton: I think another thing that we can bring to A&P courses, the fact that it crosses over so many different concepts, so it can be kind of a recurring theme that helps students tie things together and see how things connect. So we can talk about blood doping when it comes up when we talk about erythropoietin. We can talk about it again when we talk about steroids. Kevin Patton: We can talk about it again when we talk about muscle activity. We can talk about it again when we talk about respiratory activity and how that affects our ability to supply oxygen to our muscles. We can talk about it when we talk about nutrition. We can talk about it when we talk about the urinary system because a lot of the tests that are done to detect doping in athletes are urine tests. Kevin Patton: So how does that work? What is it about how urine is produced to allows us to also analyze urine for what’s going on in terms of the bloodstream in the human body? Oh by the way, I said that for many years I had a page on my website about doping, and I just finally gave up on it because there’s so much information coming out about it. I just couldn’t keep up with it. It was like drinking out of a fire hose. Kevin Patton: There’s no shortage of information available to you as an A&P instructor or to me as an A&P instructor about doping. I think it’s a matter of just kind of keeping up with what’s the latest story. Pretty much every day during the Olympics and every week during the rest of the year, maybe multiple times every week, we’re getting news about different doping scandals and different kinds of doping and ways to get around the doping tests and so on. Another one of these ‘in the news’ things that we can use to help liven up our Anatomy and Physiology discussions. Kevin Patton: Concept maps. One of my favorite books about teaching is James Lang’s little book called Small Teaching: Everyday Lessons from the Science of Learning. Now what small teaching means, at least the way James Lang uses it, are little things we can do to enhance our course. That is things that don’t take much time. They don’t necessarily take much effort or even much pre-planning, but they can have huge effects on the teaching and learning that happens in our course. Kevin Patton: Now the way he describes concept mapping is a fast and easy method to help students visualize the organization of key ideas in your course. And the kind of concept map that he really is thinking of is really the simplest kind. You’re probably already familiar with this. Kevin Patton: Imagine if you will, a big sheet of paper that you have, and it’s blank. And so you’re going to think about some idea that you’re either going to teach, or that you’re trying to learn. And you take the main idea, the main central concept of whatever that is, and you just write it down in the middle of the paper. You draw a circle or a square around it, and then you think well what are the connected ideas. What are some things that are part of that, some things that are related to that, that I need to know about and help me understand it? Kevin Patton: I’m going to write those down around the main idea. That is I’m going to sort of encircle that main idea that I’ve already drawn. So I draw those around. Maybe there’s three or four or five of them. And I’m gonna draw a little circle around each of those or a little square or whatever it is. Kevin Patton: Then I’m going to draw a line to connect them, so imagine a central hub where I’ve written my main idea. Then spokes going out from that hub. And at the end of those spokes are little boxes or circles that each contain the name of a related concept or a related idea. Kevin Patton: That’s a very simple concept map, and what I’m going to do as I continue this process is I’m going to maybe draw some more spokes out from one or more of those related ideas. So I’m going to be adding more content, maybe organizing categories of the tissues of the body, or maybe I’m categorizing the different strategies by which our blood is able to transport blood gases, Co2 and oxygen. Maybe even at some point add in there carbon monoxide or some other gas that can get in there and become part of the story. Kevin Patton: And I’m probably going to jot down little notes around those titles of the concepts or the facts that I’ve written. And maybe start using some color coding to sort of keep things straight for one thing and maybe to categorize different ideas. I’m gonna have these lines all over the place. Some of them radiating out from the name of a concept. But some of them are going to be cross-connections that I’ve realized occur. Kevin Patton: And every time I draw a line I’m probably going to jot down along that line how it relates. Is it part of it? Does one thing cause another and so on. I’m going to be adding layers of information to this, even though it’s still pretty simple little map that I’ve drawn, and eventually, we’ll have processed all of that information that I have about that idea. Kevin Patton: So it’s a way for me to learn that, to put together the various facts that I’ve learned in my reading. Maybe I’ve attended a lecture. Maybe I’ve already done some practicing with test items online, some homework items. Maybe I’ve watched a video. Maybe I’ve worked on a case study. Maybe I’ve done some other kinds of … You know the list is endless. Right? But I’m putting it all together, and I’m making a map. And I’m making a map that fits the way I understand it as an individual, so I as a teacher or I as a student. Kevin Patton: What a concept map does for one thing is it shows us how each of us understands the concepts that we’re studying. It fits our own way of thinking, not the author of our textbook, not our instructor, not the instructor down the hall that has gone through this concept with us and how they teach it. It’s our own way of understanding it. Kevin Patton: The other thing it does is it is a reflection of our current level of understanding. That is how we understand it at that moment. That understanding is gonna change over time. As teachers, we start to understand concepts more deeply the more times we review them ourselves, and the more times that we present them to students, and the more reading we do, and the more little tidbits we hear from our colleagues. Or from journals or books or whatever that we’re using to keep up in our field. Kevin Patton: Because they’re so individual though and because they continue to change as our understanding changes, they’re also sometimes called ‘mind maps’ because they’re a reflection of what’s going on in our mind in terms of understanding those concepts. Now concept maps have been around for a long, long time. They’re really any visual way to represent ideas, so I would propose that they go all the way back to cave paintings. So they’re a really old way of teaching and learning. Right? Kevin Patton: But it wasn’t until the early 1970s that a guy named Joseph Novak sort of got it into the literature. He proposed it as a method for learning science. But of course, since the early 70s, it’s spread far and wide to all kinds of disciplines. But Anatomy and Physiology is in the sciences, and so it’s kind of where the home of concept mapping is. Kevin Patton: Oh man, it was almost 40 years ago when I took a course as an undergraduate called Methods of Science Teaching. I remember our professor introducing them to us, and boy she was really excited about this brand-new thing called concept mapping. And boy your students are really gonna get a lot out of it. So it’s something that I’ve been using for decades in a variety of different ways. I’ll mention a few of those today. Kevin Patton: Now one of the things about concept mapping that I love in terms of using it with students is it forces them to connect ideas. Of course, it forces me as a teacher to connect ideas too. And by constructing the map, we are learning in a very active way. Kevin Patton: As a matter of fact, that word itself literally refers back to or reflects where Joseph Novak was coming from when he was proposing this as a teaching and learning tool, because he was coming from a philosophy of teaching called constructivism. And the constructivist idea is that when we learn, we build a framework. We build ideas. We build a knowledge, a conceptual framework. Kevin Patton: What concept mapping is is visually drawing out our conceptual framework at least as it exists at that moment in time. So by using our kinesthetic sense, by using our muscles, by using our visual sense to draw this out, we’re not just passively sitting in a lecture hall with our arms folded trying to learn by osmosis. We’re actually being active and trying to put together a puzzle, and we’re making the pieces, and we’re fitting the pieces in where they’re supposed to go. Kevin Patton: When a learner does this, it helps him see the patterns. It helps him see relationships. By the time they get done, I think they’re really seeing the big picture in a way that we really try to do. We try to give them that big picture, but it’s not until they get there themselves that they truly own that picture. Kevin Patton: And in trying to fit everything together, it’s also been shown to foster creative thinking. And creative thinking is one of those higher order learning skills that we certainly want to be promoting in our courses. Kevin Patton: Another thing that concept maps do, that I think is great is it identifies and corrects weak areas of understanding. And how it does that is when you’re building a concept map, and you know that something belongs in your concept map, some process. Kevin Patton: Let’s say we’re talking about the different ways that blood gases are transported in the blood, and we get to this idea of bicarbonate. And think gosh, I don’t understand what that has to do with blood gases. Bicarbonate? Is that a blood gas or isn’t it? Do we breathe in or breathe out bicarbonate? Kevin Patton: So once I get to that point, and I don’t know what it is, and I don’t know where to put it in my concept map, I’ve just identified a weak area of my understanding. So what am I gonna do? Well if I’m a motivated learner, what I’m gonna do is try to get the answer. I’m gonna go back to my textbook. I’m gonna go back to my course notes. I’m gonna perhaps seek out the help of another student, of a tutor, heaven forbid, go to my professor’s office and ask for help. And I’m gonna get that fixed, so I know where on the concept map it goes. Kevin Patton: So I’ve just identified a weak area of understanding that I didn’t even realize was something I didn’t get because well, I went to the lecture, and I thought I understood everything. But here I am forced to arrange things in a logical way, in a way that I understand them, and I’m finding out here’s something I don’t understand at all. Kevin Patton: Another thing that it helps me do in much the same way is it helps me identify and correct misconceptions. In other words, I might think I know the idea of what bicarbonate is, and how it fits into the story, and how the body is using bicarbonate as a way to carry carbon dioxide in the blood. When I get to drawing my concept map, I don’t really know exactly how to put it there, how to connect it up. Kevin Patton: Or I might put it in the wrong place, and I start building this, and then I realize, whoa, something is not working here. I can get from A to B, but I can’t get from B to C, so that must mean my road from A to B isn’t right. I’ve misunderstood something. There’s a misconception. Kevin Patton: Or maybe I build my whole concept map and not realize that it’s all built upon one or more misconceptions. But once my fellow students look at it, or maybe my instructor or tutor looks at it, they say, oh wait a minute. Things don’t fit together here. So it can be used along with others to help them identify where your misconceptions are. Kevin Patton: And I don’t know about you, but as an instructor, when I have a student come to me and say look, I’m struggling here. I’m not understanding things, or I’m not performing as well on the test and exams as I think I should be. Please help me. I always tell them to bring with them all of their study materials. And if they show up with nothing, well that’s a place to start, isn’t it? Kevin Patton: But because I’ve already told them about concept mapping, hoping that they’ll bring one or more concept maps with them. If they don’t, then I’m gonna send them out and tell them come back. Draw a concept map and come back. Or sit down with me now, and we’ll draw a concept map. And once we do that, I can look at it and say, okay, I see where the misunderstanding is. I see that you have a misconception about this or that or the other thing. Now I can help them fix it. Kevin Patton: I’ve sort of already mentioned the two main ways that I use it in my A&P course. One is I suggest it as a strategy for individual study. And in order to do that, I show them how to do a concept map. I also sometimes assign concept maps, either assign them individually or assign them as a small group. Kevin Patton: I can even do this on the fly. This is a great thing to do when I’m having a discussion or doing a small lecture or I’ve asked some questions in class, and it’s clear that folks just aren’t getting something that I thought they were getting, that they need to be getting. Kevin Patton: So I’ll say, okay, let’s pair up or let’s divide up into small groups, each little table. Everybody draw a concept map. Every group draw a concept map. I might say, okay, here’s our topic and just leave it at that. Or I might give them some organizing principle like arrange … Well let’s say it’s tissue types in the body. I’ll say okay, arrange them according to their categories. Kevin Patton: Or I might use a different organizing principle and say, okay, arrange them by functions in the body. Of course, you and I know that’s gonna end up looking like the same map probably. Or I might say well base … Let’s say we’re doing epithelial tissues, and I’ll say okay, do a concept map according to how many layers they have. Just to get them thinking, and it could be something very simple. It could be something very complex depending on what my goal is in having them do that. Kevin Patton: Sometimes to get them started with a concept map, especially if it’s something very complex is I’ll draw up my own concept map the way I think of it. And then I will remove certain key parts to it and just leave a little blank box or circle there for them to fill in. Kevin Patton: That takes much less time, and it kind of jump-starts their thinking like okay, I get where he’s going with this, and I think I can fill in the blanks here. I think I know at least where to find that information. I’ll fill it in. You do that a couple of times, and they start to get the hang of concept maps. And they don’t need the training wheels anymore, and they can go and just start with a blank sheet of paper. Kevin Patton: Another way that this can be used is as an assessment tool. That is a way to reflect a learner’s current understanding. I know my colleagues over in our nursing department, they use this all the time as an assessment tool. When a student is turning in their care plan or some other assignment, it often has to be in the form of a concept map or at least accompanied by a concept map. Kevin Patton: So their instructor can look at that and see well, do they really understand why it is they’re doing what they’re doing. Are they just parroting it back from somewhere they’ve copied from? Do they really understand why they need to be doing what they’re doing? And we can do that in Anatomy and Physiology too and use that as an assessment tool. Kevin Patton: To summarize the idea of using them in different ways in your course, one is to use them as something you assign and give to students. So the students are doing them. Or something you just recommend they do on their own. Kevin Patton: Or it’s something that I do in class to present ideas. I draw my own mind map, and I can map out when I’m teaching them an idea, whether it’s in the classroom as part of a lecture or as part of a discussion, or whether I’m using a flipped or partially flipped classroom, and so I can do that on a PowerPoint presentation or on a video or something like that or some other activity. Kevin Patton: I can even make it part of a case study assignment where they have to draw a concept map as part of what’s going on. Or I might provide them a concept map of what’s going on in this case to at least get them started. Kevin Patton: What I mean by two different ways is, is it from the teaching end or is it from the learning end. Really, I shouldn’t keep harping on this idea of two different ways because really there’s all kinds of iterations of this. I mean almost infinite iterations of how you can use a concept map. Kevin Patton: Now like anything, they work better with practice. So the first time you do a concept map it’s gonna be kind of clunky, and it’s not gonna feel comfortable. The first time your students do a concept map, it’s gonna feel clunky, and it’s not going to feel comfortable. So keep that in mind, that it’s something that has to be practiced before you get good at it. Kevin Patton: My suggestion is to give frequent spaced opportunities to do concept maps. The more you do it, and the more you give a little time in between, so they kind of forget what it’s about before they do the next one, the more comfortable they’re gonna get to it, and the more likely it is they’re gonna get to a point where it’s just gonna be second nature to them. Kevin Patton: If you start assigning them, it also promotes their individual use meaning that the more you assign them, the more they’re gonna think of that as a go-to way to do study, active studying on their own anyway. Or if they’re studying in groups, which I hope they are, it’s gonna be a go-to way to help explain ideas to the other students in their study group. Kevin Patton: Now not only do I use them myself in class when I’m teaching or on a video or whatever to draw them out or some other way. I also point them out in the textbook. I don’t know of a science textbook, certainly I don’t know of an A&P textbook that isn’t just filled with various kinds of concept maps, simple ones, complex ones and so on. Kevin Patton: So when we’re looking at a diagram from the book, I don’t say, okay look at this diagram from the book and go on from there. I say, “Look at this concept map from the book.” If I start using the terminology, they start hooking that with what they already know. Kevin Patton: They’re, well a constructivist would say, they’re building their conceptual framework. That’s becoming part of their concept of learning, and that is the idea of building a framework and using concept maps. They’re using that terminology and making it part of their own language and therefore their own thinking. 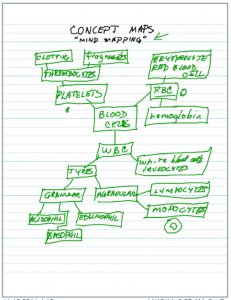 Kevin Patton: A couple of practical tips that I can give you about concept maps. One is I almost always come to class, if it’s a face-to-face class, I almost always come to class with 11×17 paper. That’s that double-size paper. I just get it from my copy center. We have it stocked. Or you can order it or get it at the office supply store, whatever. Or sometimes I’ll bring poster paper or you know, what the heck, you can just use regular-size paper. Have somebody tear paper out of their notebook. Kevin Patton: But by bringing 11×17 paper, gives them a nice big sheet of paper. I usually bring a box of pencils with me too and throw in color pencils and so on. And say, okay … Well since I always bring it with me, I don’t even have to pre-plan it. Kevin Patton: I can just in the middle of class say, okay they’re not understanding this idea of transport of blood gases, so let me shake them up a little bit. Let’s spend 10 minutes doing concept maps. And so here’s some 11×17 paper if you want to use it. Here’s a box of pencils if you don’t have your own, and let’s do a concept map. Kevin Patton: I can also have individual students or groups of students, pairs of students come up to the white board and draw concept maps. And there’s a lot of software out there too. Too much to go into here, I’ll just be reciting off the list. But just to get us started, Microsoft Word and PowerPoint, both have that word art or different kinds of flow charts and so on that you can just build right in there. Of course, your students have access to those as well. Kevin Patton: Even the free Office alternatives like the one from Google and various other opensource ones. There’s also a ton of online options that you can either download the software to your device or just build the concept map right there in a webpage, and then save it. You can have students build those and save them and either print them out and turn them into your or upload them into your learning management system and look at them that way. Or have them email them to you. Kevin Patton: If you go to the show notes for this podcast, I have a link to a page that has kind of a starter list of that software if you want that. Kevin Patton: So the idea of concept mapping is that it’s something small. You can use technology. It’s widely available, but you don’t have to. You can use, well it’s still technology, a pencil’s technology. Right? A pencil and paper, that’s it. And you can just do it at the drop of a hat and say, okay, let’s do a concept map now. Or you can pre-plan it and have it part of an assignment or part of a case study or whatever. Kevin Patton: It’s easy, super easy. So it’s small, it’s easy, but the big thing here, and you can look this up in the literature if you want. It’s effective. There’s a pretty rich literature out there showing you how effective it is. So concept mapping, please drop me a line, and let me know how you’re using concept mapping. And we’ll share it on the podcast. Aileen: The A&P Professor is hosted by Kevin Patton, professor, blogger, and textbook author in Human Anatomy and Physiology. Opinions expressed in this episode are not necessarily those of anyone connected with this production.